Getting to Kaikoura is easy – and the journey is as wonderful as the destination. The drive south alongside the Waiau River passes Marble Point (look for the skeins of red marble) and some beautiful hills and dales with limestone formations and the picturesque Waiau River (what colour is it today – blue, green, grey, brown, turquoise?). You’ll turn left onto the inland Kaikoura Road which will take you through the historic settlement of Rotherham – you may like to take a peek inside the village’s historic cob cottage (you’ll find it on the right side of the highway as you head north). Coming in to Waiau, check your fuel as this is the last place before Kaikoura. Head north out of Waiau towards Mt Lyford. Mt Lyford Lodge (an enormous log cabin) is worth a stop, it’s a great place for a bite to eat and a refreshing drink, and if you take a short drive to the top of Mt Lyford village road you’ll get to enjoy some incredible views. The rest of the drive north-east through to the coast is equally stunning, with rolling Hurunui hills and patchwork plains. 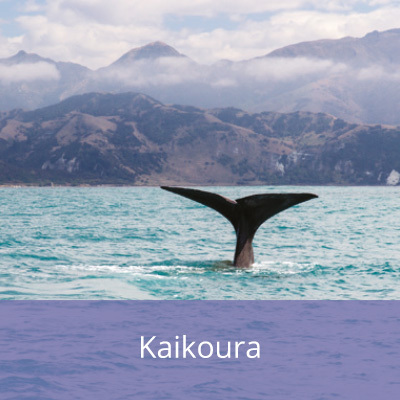 Kaikoura itself is famous for the whale watching tours on which you can often also see the worlds largest seabird, the albatross. There are also kayak tours which get right up close to seals, penguins and dolphins. The walkway around the headland offers great views of both the north and south bays, and you can walk out across the newly uplifted seabed (from the 2016 earthquake) and get quite near to the seals. On the way home, you may want to head south to take in some more of the Kaikoura coastline and the town of Cheviot before heading back to Hanmer Springs via the charming Leader Road. On the way in to tiny Waiau, watch out for the Waiau sign on the northern side of the village – the views are sensational and make a great photo stop. Waiau has some lovely heritage worth exploring on its village green and nearby the local shop sells very good scones, classic country baking.